Hot off the back of a stunning performance on Wales Rally GB, where he finished 14th overall and second in SWRC in the second official PROTON Motorsports Satria Neo S2000, Welsh rally driver Tom Cave heads to Yorkshire next weekend, for the finale of the MSA British Rally Championship. 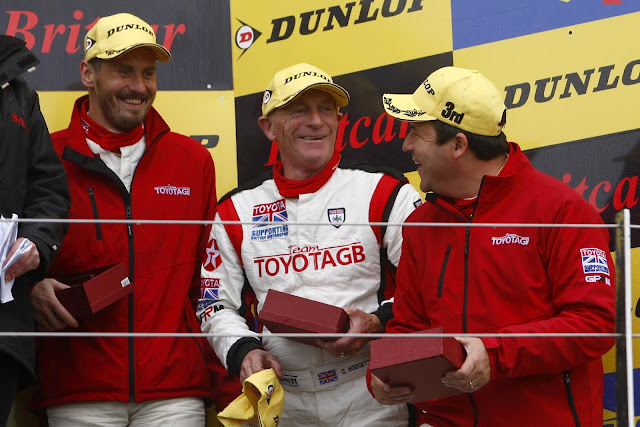 Tom, and co-driver Craig Parry, are currently lying third in the championship and while there are six drivers who can mathematically win the series, two are not competing in Yorkshire, so it will be a four-way fight for the 2012 title. The favourites are likely to be Tom and former double BRC champion, Keith Cronin. Tom is just four points behind Cronin and with 50% extra points available in Yorkshire and dropped scores coming into play, the possible permutations are huge. However, from Tom's point of view, he knows that to stand any chance of clinching the 2012 BRC title, he has to put in the performance of his career. He is already riding a wave of confidence, following his Wales Rally GB success, coupled with a win in Thailand with Proton and outright wins on the Coracle Stages and the Mid-Wales rallies earlier this year, in addition to a win in the BRC. And while it looks like a difficult task to best Cronin, who would appear to only need to finish eighth in Yorkshire to wrap up the title, Tom knows that nothing is decided until the end of the event. Commenting ahead of the rally, Tom said; "I think Rally Yorkshire will be one of the hardest events of my career. There is so much at stake that getting the right balance on the event will be crucial. "The obvious strategy might be to push at maximum attack from the off but this could quite easily backfire, as if I fail to finish and the others do well, I could go from second to fourth in the championship. "However, if I settle in and go for a reasonable result, particularly ahead of Osian [Pryce] and Jonnie [Greer], then that could help cement second in the championship, which wouldn't be a bad result for my first season contesting the full BRC. 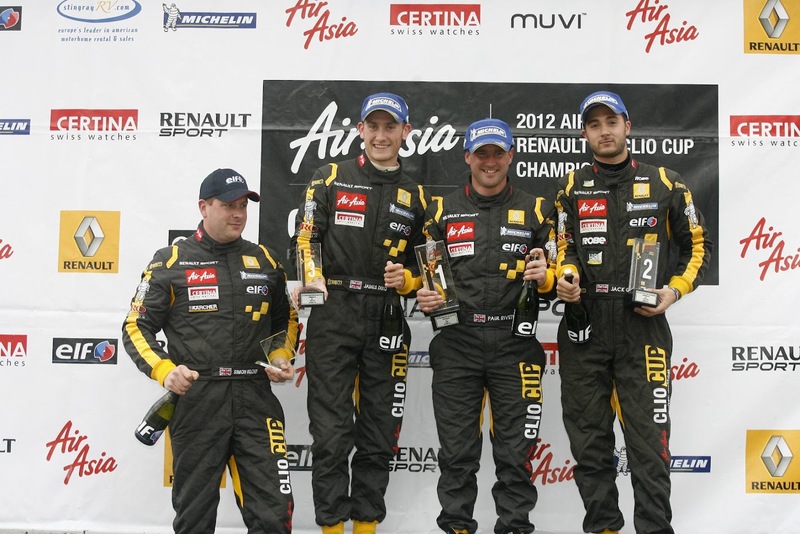 "That could also mean second in the Citroen Racing Trophy. However, if I come home as the first driver under 23, I win a significant credit for parts against an entry in the Rallye du Var in France in 2013. "Of course, aiming for a solid second place could also be rewarding if Keith has a problem, such as another mechanical issue like he had on the Sunseeker. I think the only thing that is certain is that we won't know who's champion until the stop line of the last stage on Saturday." The event begins with a ceremonial start on the seafront in Scarborough in the evening of Friday 28 September, followed by a single special stage that evening. There then follow a further five stages on Saturday 29 September, run in the infamous Dalby Forest, before the first crews are expected at the finish, again on the seafront that evening. Silverstone, the home of British motor sport, is the scene for the penultimate race weekend for the 2012 Porsche Carrera Cup GB as Michael Meadows tops the title race heading for rounds 17 and 18 (6/7 October). With four of the season’s 20 races left to run, Meadows has a firm grip on the overall title in a year when six drivers have already won races, while Ahmad Al Harthy is setting the standard in Pro-Am1 and Will Goff heads Pro-Am2. Carrying a 54-point advantage into the pair of races at his home track, Banbury-based Meadows (Redline Racing) is very much in control in a season where he has blended speed and consistency to win five races and finish on the podium 13 times in 16 races. If he can maintain that form at Silverstone, Meadows could be confirmed as champion by Sunday afternoon as a margin of 45 points with two races still to run at Brands Hatch would settle the matter. But Meadows knows this will be no easy task and with a gaggle of drivers currently battling over second place, he cannot afford to let his guard slip for a moment. The man on stunning form just now is Ben Barker (Parr Motorsport) with four wins on the trot at Knockhill and Rockingham and he is determined to maintain that form at Silverstone. 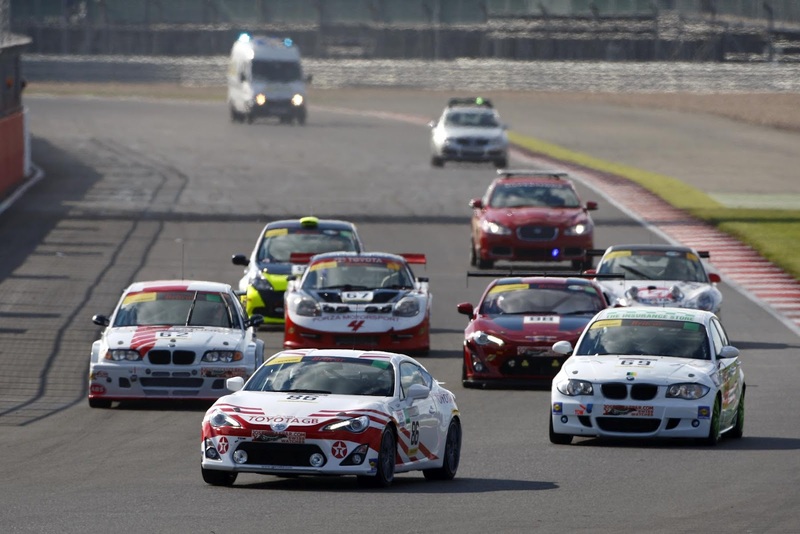 Barker’s recent run of success has taken him two points ahead of Sam Tordoff (Team Parker Racing), while Jonas Gelzinis (Juta Racing), Rory Butcher (Celtic Speed) and Daniel Lloyd (Team Parker Racing) are all chasing hard. Other drivers aiming for a visit to the Silverstone podium are Richard Plant (Team Parker Racing), Andy Meyrick (Team Parker Racing) and former double champion James Sutton. 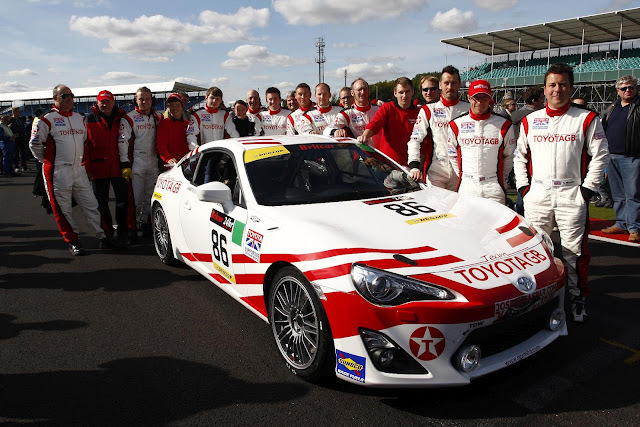 Having rejoined Redline Racing last time out at Rockingham, Sutton will race alongside Meadows in a bid to secure a fifth team championship title for Redline. It is the Redline team that is also at the head of the Pro-Am1 title race as Ahmad Al Harthy heads to Silverstone with a 48-point advantage. The Omani racer is having a superb season, with 10 wins from 16 races, and if he can end the second Silverstone race with a 45-point lead, he will be Pro-Am1 champion. Leading the chase of Al Harthy and battling for second place are Oly Mortimer (GT Marques), Derek Pierce (Team Parker Racing) and Victor Jimenez (Redline/Oman Air) and anyone of them could emerge on top at Silverstone. The Pro-Am2 title has come down to a straight battle between Will Goff (Goff Racing) and Tania Mann (sibsport performance) and Goff currently has the upperhand after Mann suffered a troubled weekend at Knockhill. After qualifying at 12.55 on Saturday, round 17 will start at 09.00 on Sunday, with round 18 at 15.45. 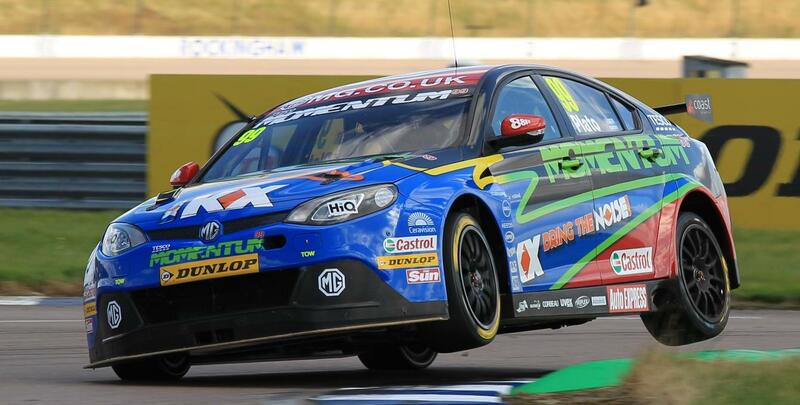 Round 18 will be broadcast live on ITV4 during the extensive BTCC programme which runs from 11.00 on Sunday. 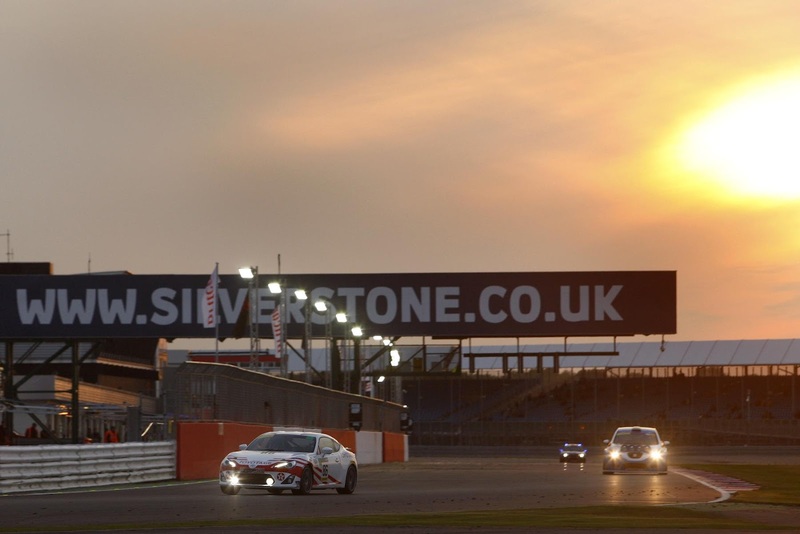 Little more than a week remains before Northamptonshire’s world-famous Silverstone circuit (Sat 6/Sun 7 Oct) hosts the crucial penultimate round of this year’s Dunlop MSA British Touring Car Championship. The three races at Silverstone will decide who will then still be in with a chance of winning the UK’s most prestigious motor racing title on Finals Day at Brands Hatch in Kent a fortnight later. 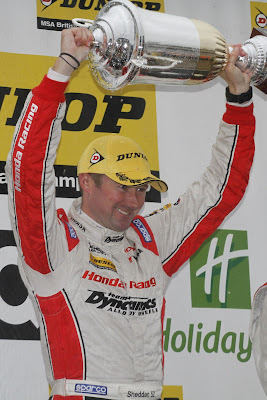 Seven drivers can mathematically still be crowned BTCC Champion in 2012, namely Honda Yuasa Racing Team team-mates Gordon Shedden and Matt Neal who lead the way, MG KX Momentum Racing’s Jason Plato, Pirtek Racing’s Andrew Jordan, eBay Motors pair Robert Collard and Tom Onslow-Cole and Redstone Racing’s Mat Jackson. Arriving at Silverstone it is Hampshire’s Collard, Surrey’s Onslow-Cole and Warwickshire’s Jackson who will be most under pressure to perform if they are to keep their fading title hopes alive. All are presently more than 67 points adrift of leader Shedden with that then being the maximum available when the cars take to the legendary Brands Hatch Grand Prix circuit for the season finale on the weekend of 20/21 October. Of the four ahead, two wins for Scotsman Shedden last weekend at Rockingham, also in Northamptonshire, have moved him into the championship lead by three points from Worcestershire’s Neal. Shedden has never won the BTCC before while Neal is looking to retain his crown from last season – achieved when he defeated Shedden at Silverstone – and make it four titles to his name. For Oxford’s Plato, himself a double BTCC Champion, Silverstone is very much his home event as it is for Lichfield youngster Jordan who, like Shedden and Neal, races a Honda Civic. All three Honda drivers, though, are expecting to struggle around Silverstone’s high-speed National circuit and Plato, in his MG6, will be hoping they are right. Silverstone’s short lap and long, wide straights never fail to deliver plenty of doorhandle-to-doorhandle entertainment for fans. Indeed the view from Woodcote corner of cars slipstreaming and fanning out five abreast along the Wellington Straight is one of the most evocative of the season. As ever ‘the home of British motor sport’, easily accessible from across the Midlands just off the A43 dual carriageway between the M40 and M1 motorways, is making its big BTCC weekend hugely popular among audiences both young and old. Adult tickets for race day (Sunday) start from just £29 if booked in advance with admission for accompanied children aged 15 and under FREE all weekend. All admission includes access to grandstands, the main central BTCC teams’ paddock and Sunday’s specially organised autograph session with the star touring car drivers. To book in advance visit www.silverstone.co.uk or call the ticket hotline 0844 3750 740. In addition to the BTCC’s three penultimate races of 2012 which headline the event a further 12 races for the Ginetta GT Supercup, Ginetta Junior Championship, Porsche Carrera Cup, Renault Clio Cup and guesting Formula Renault BARC categories are also in store during the weekend. Plato pushing hard over the notorious Rockingham kerbs on his way to a win in Race 1. It's actually dry! Race day at Rockingham arrived and the MG KX Momentum team were faced with the prospect of a change in recent fortune as well as changeable weather conditions. A season’s best qualifying session for the team with Jason Plato’s fourth pole of the year and a fifth on the grid for Andy Neate ensured that the drivers came to the circuit hopeful for a good haul of points to set them up for the remainder of the season. Race One saw pole man Jason Plato take an early advantage over the pursuing field and he developed a commanding lead which enabled him to comfortably control the race and exploit the speed advantage the MG6 had over the rest of the field. Andy Neate’s race wasn’t as straight forward, dropping down a couple of places at the start, which were swiftly taken back over the next couple of laps. Andy carried on in fifth for most of the race, eventually finishing seventh after some battling with championship protagonist Matt Neal and a hard-charging Rob Collard. Plato finished the race 3.3 seconds clear of second place with a seemingly straight forward, lights to flag victory which gave him Pole Position for Race Two. Race Two was held under relentless heavy rain, giving the drivers something to think about as track conditions all weekend had been bone dry. The start saw Jason Plato take a cautious approach, losing out on a couple of places in the run down to turn one. Andy’s Race Two was short lived, being turned around at the second corner and ending up in the gravel, leaving him with it all to do from the back of the grid in Race Three. Jason stuck at it, clearly using all his experience to find out how to get the best from his car on the slippery Rockingham tarmac, this enabled him to pick up his second podium of the day with third place to add to the points tally of the weekend. Race Three and the reverse grid saw Plato start from seventh and with a few changes having been made to the MG6, his eyes were on completing a hat-trick of podiums and making further inroads into the championship lead. Andy started from the back after his brief Race Two, and his consistent approach meant he was able to move up to finish fourteenth in the spread out pack. Jason once again was faced with taking the fight to the Honda’s and a late charge in which he set numerous personal best lap times got him side by side through the high-speed turn one with Matt Neal but the move didn’t stick, it was good enough for third though and another good haul of points keeping the championship fight alive. Neal's Civic leaves Plato's MG in it's wake - despite Matt's broken hand! The Honda Yuasa Racing Team returned to winning ways in the Dunlop MSA British Touring Car Championship with two victories at Rockingham last weekend. Gordon ‘Flash’ Shedden took his seventh and eighth wins of 2012 to take the lead in the drivers’ table, while Matt Neal overcame a hand injury to score two podium finishes. 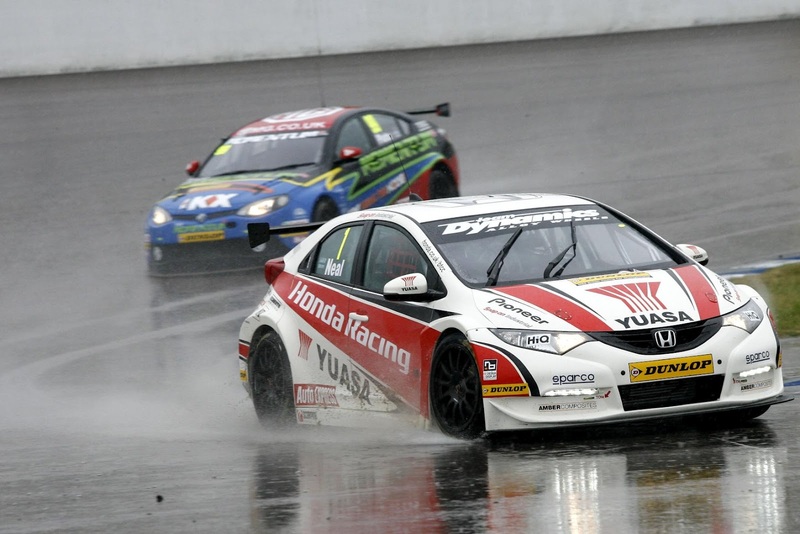 After qualifying second, Shedden chased home the similar NGTC Honda Civic of Andrew Jordan to finish third in the first dry race, three places ahead of Neal, who was involved in several close battles. When the rain arrived ahead of race two, things got even better as the Civic’s chassis came into its own. After a careful start, Shedden worked his way up to second and took the lead when Jordan made a mistake at Deene after a restart. Neal also made progress through the field, reaching second on lap eight of 18. Such was the dominance of the Civics that Shedden was able to slow down and allow Neal to overtake him to score an extra point for leading a lap before Neal slotted back in behind. Starting eighth and ninth for the reversed-grid race, and with 45kg and 36kg of success ballast respectively, Shedden and Neal had a lot of work to do. But a fantastic opening lap by Neal got him to second, while Shedden soon fought his way through the field too. They moved into first and second before battling for the win, and running side-by-side on the high-speed banking. Flash it was who won out, heading another Honda Yuasa Racing one-two. “That was a much better weekend than we expected,” said Shedden. “If you get two one-twos it’s a good weekend! Neal was also happy with his performances while driving with a strapped right hand. “After qualifying it looked ominous and I thought we would really lose a chunk of our points lead,” he said. “The MG was strong all day, but the wet plays to our strengths. Shedden now leads Neal by just three points in the drivers’ standings and is 32 clear of the best non-Honda driver, while the squad comfortably heads the manufacturers’ and teams’ tables. The Honda Yuasa Racing Team’s next outing takes them to Silverstone, scene of the climax to their successful 2011 campaign, on October 6-7. CRONIN ON TRACK AS THE CITROËN RACING TROPHY UK HEADS FOR THE TRACKROD! With three overall rally victories this year, two time British Rally Champion Keith Cronin heads into the final International Rally Yorkshire with the Citroën Racing Trophy UK lead. Cronin is on 78 points ahead of Welsh drivers Tom Cave on 69 points and Osian Pryce on 66. Northern Ireland drivers Desi Henry and Johnny Greer are joint fourth with 61 points apiece, with James Grint fifth on 52 and Jarkko Nikara sixth on 34. With a staggering 64,500€ prize fund on offer this season including a Junior prize worth 10,000€ for the first driver under 23 still up for grabs, it’s an important finale on the Trackrod Rally for the DS3 R3 mounted crews. Motorsport DS3 will be another one to watch out for, as James has impressed this season with his transition to the 210 horse power DS3. Citroën UK holds a commanding lead in the BRC manufacturer’s series going into this final round, with Keith Cronin favourite to take the overall British Rally Championship and the Citroën Racing Trophy UK series. It’s been a memorable season to date for the DS3 crews. The event begins with a ceremonial start on the seafront in Scarborough on Friday with one stage, then five long stages on Saturday using the Dalby forest complex, famous for its long straights and square corners. 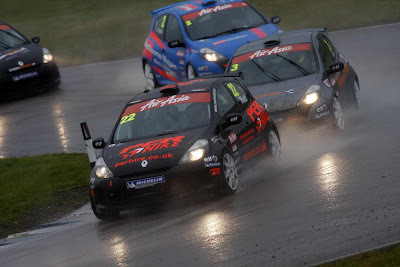 Paul Rivett completed a winning weekend claiming victory in Sunday’s wet Round 12 of the AirAsia Renault UK Clio Cup, shortening Jack Goff’s championship lead to just 15 points. The race was started behind the safety car due to the wet conditions, which favoured three-time champion Rivett who proved he has what it takes to race on a wet track as well as sea after securing the P1 Aqua X Sea-Doo Challenge title last weekend. With the lights of the safety car out, the race was go with championship leader Jack Goff bolting into the first corner. Rivett meanwhile was not going to make it easy for him, and similar to today’s previous race, Rivett pulled the exact same move on Goff for the lead into Deene hairpin. Once ahead, the Banstead driver began to pull out a sizeable lead and was the first driver to be greeted by the chequered flag to make it four consecutive wins and fastest lap. Having lead the championship from the very first weekend at Brands Hatch in April, Goff was looking to go one better than in today’s previous round, but it wasn’t to be. The High Wycombe driver produced a stunning drive, but due to poor visibility from a steamed up windscreen, he eventually had to surrender the lead and settle for the second step on the podium for the second time this weekend. Rounding off the podium in third once again was James Dixon, who, similar to all the drivers, found the conditions difficult and spent the majority of the race on his own despite setting consistent fast lap times. The 22-year old will now be looking to hold on to his third position in the driver’s table heading into the final two weekends of the season. Also replicating his finishing position from today’s earlier race was Rookie winner Josh Cook. The 20Ten Racing driver, who prefers the wet conditions, was able to hold off a rampaging Josh Files, who was also experiencing tough visibility conditions due to a steamed windscreen, to bring the car home in a strong fourth place and extend his lead by 31 points over rival Ant Whorton-Eales in the Rookie Trophy championship. Even in the tricky wet conditions, the drivers were able to keep all four wheels on the track and bring the cars home in one piece, except from Scuderia Vittoria’s Ronnie Klos and MBR’s Mike Bushell, who ran wide at Gracelands beaching himself in the gravel pit. As for the ELF Masters Trophy, it was once again Simon Belcher who brought his black and yellow KÄRCHER Clio home in twelfth place and collect his bottle of champagne, Masters hat and trophy. After four years of racing in the AirAsia Renault UK Clio Cup Championship, it was time for veteran Darren Wilson to hang up his Clio gloves to focus more on the management of 20Ten Racing Ltd. The 46-year old will not be absent from the Clio paddock as he intends on attending every race to support the team and drivers for the rest of this season and next. 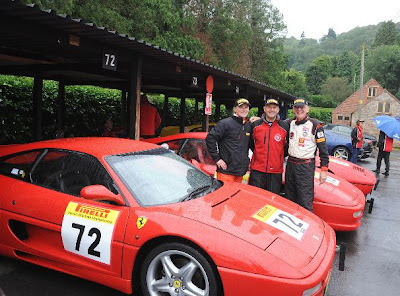 MAC member Terry Graves from Cornwall took both Fastest Time of Day awards on a weekend of diverse conditions for the last event of the season at Shelsley Walsh Hill Climb. Driving his 3.5 litre Gould GR37, chassis number 001, competitors enjoyed perfect conditions on Saturday with Terry posting a time of 26.68 seconds to win FTD, with fellow club members John Jones of Kington taking second place in his Pilbeam MP88 with a time of 27.22 and local man Darren Gumbley from Tenbury Wells taking an excellent third place in his 1100 Class Force PT single seater, with a time of 27.39. 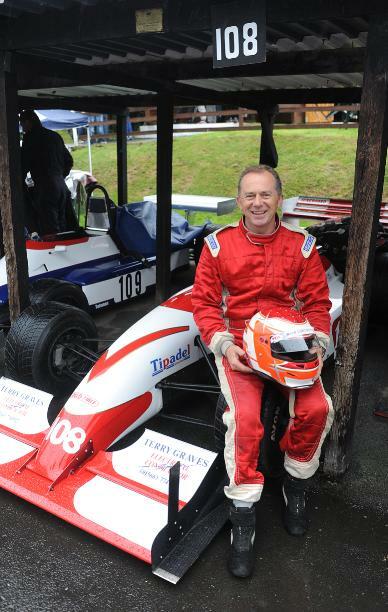 Terry commented: “I usually compete in the British Sprint Championship and at some of the South West hill climbs, but have driven at Shelsley Walsh some years ago in a Pilbeam, however, this was my first visit in this, the original Gould, so I took things pretty steady at first, but was delighted with the end result and have had a fantastic weekend. Paul Howells in his Porsche 911 RSR took the class win in the Porsche Club Speed Championship, while David Hardcastle won the TR Register class. Ben Wilkins on an Aprilia won the NHCR motorcycle run off with a time of 30.39 followed very closely by Honda rider Paul Jeffrey on 30.71, with Sam Matthewman on a Suzuki TL in 31.06. Sunday saw the conditions change dramatically, but Terry Graves once again managed to repeat his FTD, posting a time of 31.16 seconds in appallingly cold and wet weather, which thankfully seemed to make competitors respect the conditions and drive with some caution, ensuring that the meeting still ran smoothly. The Ferrari Drivers maintain sporting behaviour despite close competition! Following Sunday’s very close results, the Pirelli Ferrari Championship will now go down to the wire at the MAC’s last event of the year at Curborough Sprint Circuit, near Lichfield, in October, where Chris Butler, Richard Prior and Andrew Holman are all still in with a chance of taking the title. Invited clubs on Sunday provided close competition with Clive Glass taking the class win in the MSCC Techniques Morgan Speed Championship with a time of 41.70, Matthew Oakley won his class with a time of 39.66 in the TVRCC Speed Championship and Richard Mason took class honours with a time of 41.24 in the Healeysport Championship. Jason Plato and Gordon Shedden shared the wins in today’s three exhilarating Dunlop MSA British Touring Car Championship races at Northamptonshire’s Rockingham circuit. Two of the wins went the way of Scotsman Shedden who has now taken over the championship lead as the title race stays in the county for its penultimate three races of the season at Silverstone in a fortnight (6/7 October). Plato had taken pole position with a new qualifying lap record on Saturday in his MG KX Momentum Racing MG6. He duly went on to dominate today’s first race, held in dry conditions, and set a new race lap record en route. Pirtek Racing’s Andrew Jordan and Honda Yuasa Racing Team star Shedden were second and third in their Honda Civics. 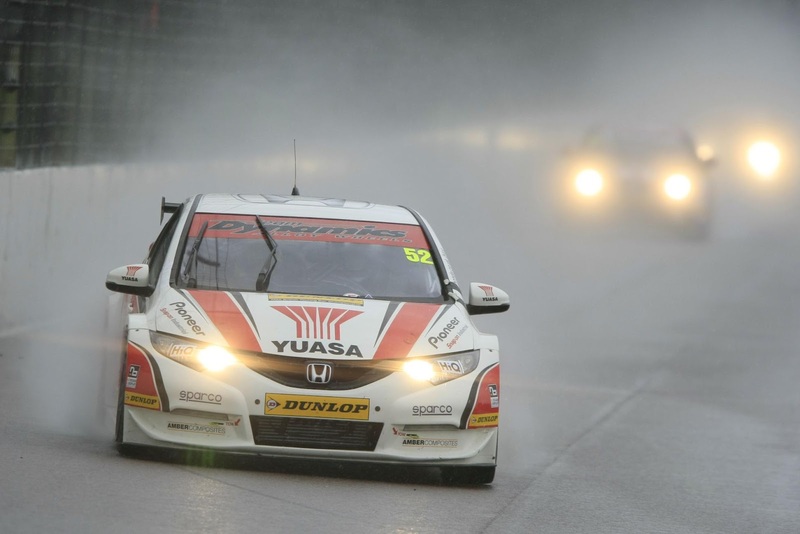 But then conditions changed dramatically as heavy rain settled in for the rest of the day, this enabling Shedden and Neal to take a pair of dream 1-2 results for their team in both the second and third races. Plato finished behind them on each occasion in third. As a result Shedden leaves Rockingham with a three-point lead over Neal. Plato is a further 29 behind with a maximum of 134 still available from the season’s final six races – three each at Silverstone in two weeks and Brands Hatch, Kent a fortnight later (Sun 21 Oct). Meanwhile Honda/Dynamics and the Honda Yuasa Racing Team continue to dominate the Manufacturer/Constructor and outright HiQ Teams championships respectively. Jordan has moved further clear at the top of the Independent Drivers Championship. And his Pirtek Racing squad has also regained the Independent Teams Trophy lead. Elsewhere several drivers were punished by officials for on-track indiscretions today. Race 1: Jeff Smith, fined £500 and three penalty points on his competition licence following an incident with Aron Smith. Race 1: Matt Neal, verbal warning following an incident with Rob Austin. Race 2, Jason Plato, verbal warning for performing practice starts. Well, it's been very slow progress as far as the website is concerned! We've been really busy and concentrating our efforts on our project with Kart Force. Because of the demands on the team's time, we're making a few changes - we'll be trying a system where we update twice a week. So, Tuesdays will be the time to visit us for Results and Reports from the weekend's action whilst Fridays will be the day for other news and event previews - maybe a few results too. So if you're a potential contributor, e-mail your results and reports to us by 9pm on Monday and your news and previews by 9pm on Thursday. We'll also be announcing our new webmaster soon.